Pineapple appears to be a very divisive ingredient, (especially when it comes to pizza, which by the way, it should absolutely be on because it is a tangy, tropical treat!) that in recent years has made its way out of the fruit salad and onto our main meal menu. A pineapple casserole might not sound like comforting food, but it’s actually very popular in the South. 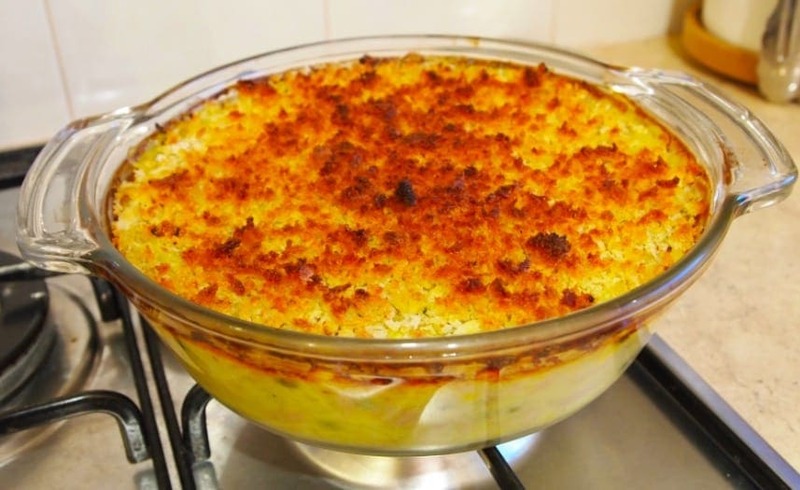 A casserole is affectionately known as ‘funeral food’ as it is one of the most popular dishes for neighbors and family members to take to someone’s house when they have suffered a loss. It’s easy to make in bulk and freezes well to allow those who are grieving just to pull it out and defrost it. It’s a cozy, warm meal that serves as perfect comfort food at any time of the year. So why is pineapple involved?! In Southern community cookbooks, you should not be surprised to see a whole host of pineapple dishes. Ranging from desserts to side dishes, you will find Scalloped Pineapple, Cheesy Pineapple Casserole and the ‘classic’ Pineapple Casserole. Pineapple is said to be a symbol of hospitality, so it is no wonder that it is such a popular quintessential Southern dish, especially on the buffet table. Drain both cans of pineapple, and collect the juice in a bowl, putting the juice to the side for later. Whisk together your sugar, flour, and salt, before adding the grated cheese. Toss around the cheese to ensure that it is fully coated with the dry mixture and that there are no lumps. Add both forms of pineapple to the bowl and stir until there are no visible dry ingredients and everything is well combined. Grease a two-quart baking dish and add this mixture to it, smoothing it out into an even layer. Place the crackers into a zip-lock bag and crush in your hands, or with a rolling pin until they are mostly fine crumbs, with a few larger lumps. In a clean, dry bowl add some melted butter and ¼ of the cup of pineapple juice to the crumbs and mix. Add this crumb mixture to the top of your casserole, spread evenly across. Cover the casserole and refrigerate until required, up to one day. To serve, cook on 350º F for around 25-30 minutes, until the top is golden and the pineapple is cooked through. Serve warm. Pineapple and cheese shouldn’t go so well together, but if it works on a pizza (which it does! ), then why not a casserole?! The best thing to do with this dish is to go into it with an open mind and try not to have any preconceptions. Once you’ve made it, and given it a go, this is likely to become a family favorite, even if it is a little kooky!